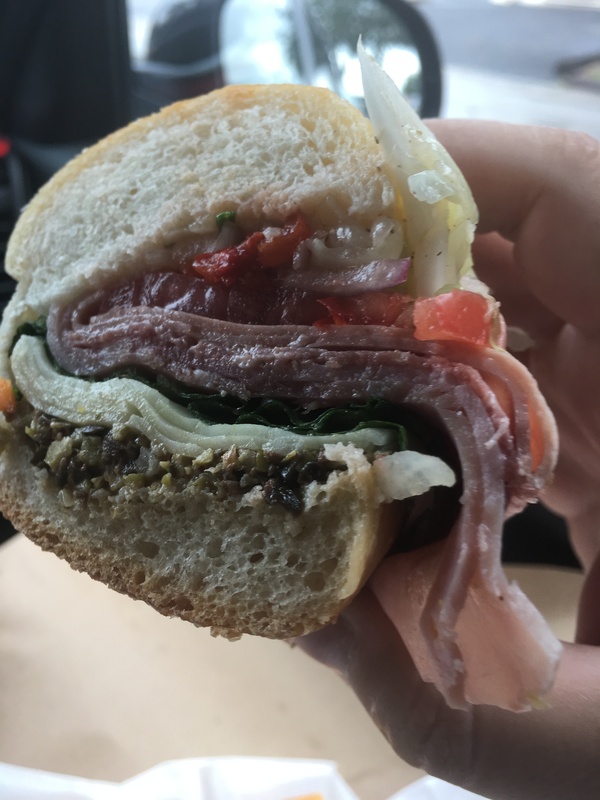 In our final stop in the series of “In Search of Muffuletta” that ran all summer long, we went to Mazzaro’s Italian Market in Saint Petersburg, Florida. This place is amazing. They have everything you can imagine that an Italian Market should and some things that you wouldn’t think they would have at all. Freshly made mozzarella? Yep. Wine? Oh yeah. Local honey? Si. Home made pasta? Indeed. Habanero raspberry jelly? You know it daddy. I like the kid in the candy store. I set a spending limit of 50 dollars before walking in. If I hadn’t, then my whole paycheck would have gone to the Mazzaro family, easily. The sandwich could not have been better. It is the closest thing to Central Grocery in New Orleans as possible. It was big, juicy, room temperature, on fresh made bread. It was loaded to the gills with salami and mortadella. The olives and capers tasted magical. The bread was so soft but a bit flaky on the outside. It could have only been better if I made it myself. The mix of all of the flavors of the olive tapenade came together perfectly. Something that the sandwich makers should be proud of. Not to be outdone, we also tried the chicken parm hero. This was perfect as well. The only chicken parm that I ever had that was better, would have been made by my grandmother. All in all, this was the best version of the muffuletta that the Tampa Bay area has to offer. Starting later this month, I will start a new “In Search Of….” series with my quest to find the perfect NYC-esque bagel here. I am sure that it will be easier to find than the muffuletta and just as much fun. Next Eat UP: Rib A Mania 2!